As parents, it’s natural to want to wrap up our kids in cotton wool. We want to protect them from the world and ensure they never get hurt. However, being overly protective will in most cases hinder, rather than help them. Keeping them in that protective bubble won’t result in independent children (or independent adults). Our kids, unfortunately, aren’t ours to keep forever as our “babies”. It’s our job to teach them the skills they need to be happy and productive members of society. They need to be able to go out there and reach their dreams and ambitions and to be able to stand on their own two feet. And a lot of this starts early on – earlier than you might think. It’s not to say we should expect our kids to be able to fend for themselves from a young age. Far from it. Instead, we have to teach them skills that are appropriate for their age, which will all come together later on and lead to them being an independent individual. 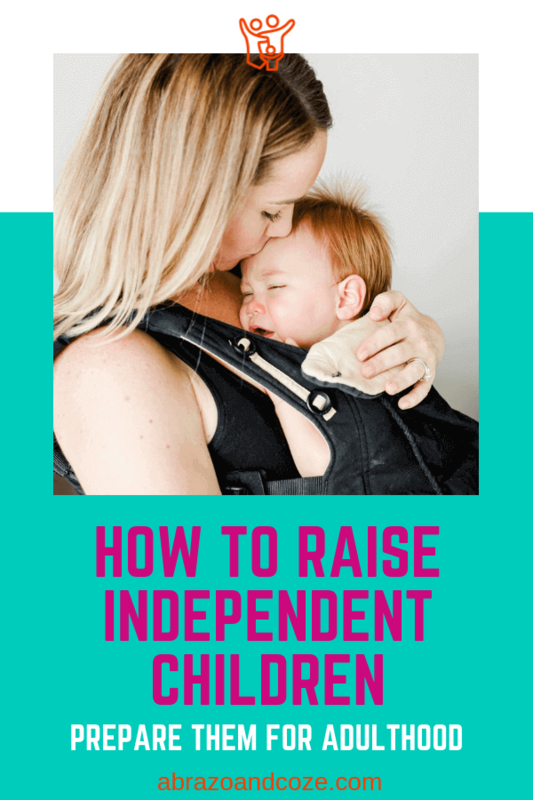 Right from the start, we can foster independence by following an attachment parenting lifestyle. Very simply, attachment parenting means keeping your baby close and letting them be dependent on you. Babywearing, breastfeeding (or holding them while bottle feeding), cosleeping (either bedsharing or room sharing, following safe sleep guidelines). Being responsive to their needs and gentle in your guidance. When infants and babies feel secure and safe, they are more likely to have the confidence to strike out on their own as independent children. We learn far more through making mistakes and errors than we do from getting things right the first time. 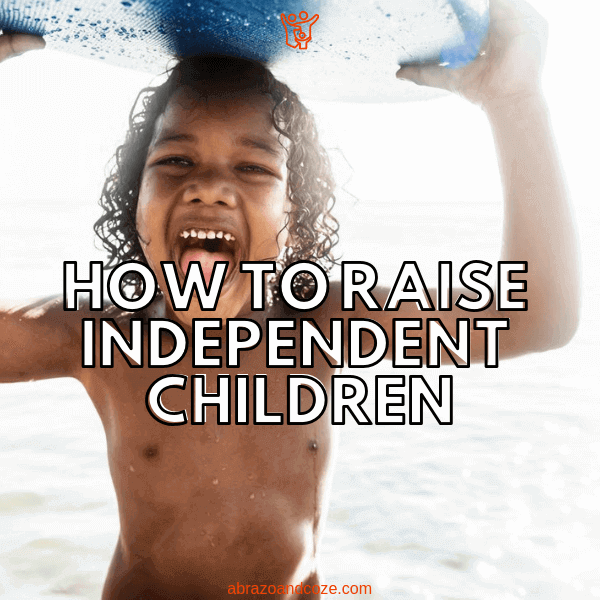 This learning process is key to raising independent children. They need to know it’s okay to make mistakes, that they’re simply learning opportunities. Mistakes just mean they need to try again (and again). When you’re teaching your child a new skill, show them what to do. Then, take a step back and let them have a go. Don’t be tempted to keep interfering, simply offer encouragement and help when they really need it. Whether it’s learning to tie their shoelaces or mastering a new song on the piano, practice means improvement. If they feel as though they’re free to ‘have a go’ and won’t be met with frustration, anxiety or stress when they make a mistake then they’re much more likely to stick at it. It’s only really during our later years that we see giving up and failure as an option in the things that we do. Young kids don’t think like this, and it’s up to us as their parents to foster that desire to keep trying. The chores your child can do will greatly depend on their age and ability. So have a think, and come up with a list of things that are suitable for your child. It could be anything from making their bed every morning to walking the dog to laying the table before dinner. Reward them for their hard work. A sticker chart is a good system for helping your children complete chores independently. When they complete a chore, they can mark it off with a sticker. This serves two purposes. One, it allows your child to see what chores they’ve completed, and which still need to be done. And two, it’s a small reward for actually completing the chore. Seeing what chores they need to do and which they’ve completed help them to become independent children. You’re giving them the tools they nee to succeed. Depending how you do allowances at your house you might pay them money for the chores they complete, in which case the sticker chart also serves as a paysheet of sorts. For a particularly hard-working child who independently completes their chores regularly, you might even reward them with a special day out. Don’t go overboard on rewards, however, as they can backfire. You want independent children, not children who do things solely because they know they get rewarded if they do. The teenage years can be tough as really they’re still children but they feel like adults. They crave responsibility and feeling like they’re grown up, but in many cases are nowhere near equipped to deal with adult life. However, there are things you can do to give them a taste of how things will be as an adult. Encourage them to get a part time job, and show them how to budget their money. Let them take driving lessons. A second hand car and used car warranty shouldn’t cost that much and it’s something you could give them for a Christmas or birthday present. They can then foot the running costs themselves either with pocket money earned from you or their part time job. Teach them how to use a washing machine. Ensure they know how to cook, and how to keep a household running. Let them practice those skills regularly. All the things they’ll need to be able to do within the next few years need practising. And it’s easiest to accomplish the goal of raising independent children by starting when they’re younger. Of course, getting into good habits useful. But when kids have everything done for them they can easily become spoiled and entitled. When I was in high school, I took a parenting class. As part of that class, I had to volunteer at a daycare for a couple of days. Teenaged me saw all these tiny humans doing things that I didn’t expect babies to be able to do… things like putting on their snowpants, coats, and boots. They weren’t babies – they were 18 month old toddlers – but highschooler me was amazed at what they could do on their own. Not surprisingly, a few of them didn’t like putting on their own outdoor clothes and asked me to do it, which I did. The teachers scolded me. They said learning to do it on their own, and practising that skill, was an important part of their development into independent children and eventually adulthood. One of the main things you have to learn in the transition from childhood to adulthood is that unfortunately, you sometimes have to practice often to become proficient in new skills, and sometimes we just have to do things we don’t want to do. 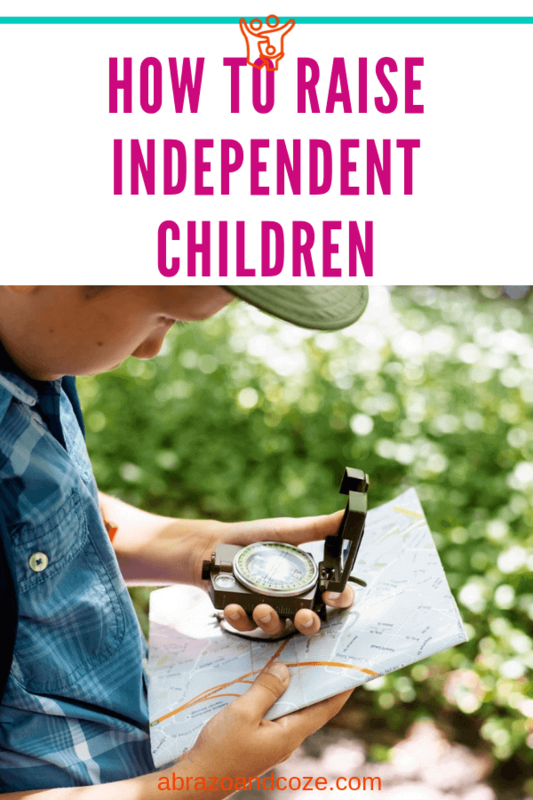 Whether that’s getting up to go to work and dealing with your responsibilities and commitments, doing age-appropriate chores, or self-care tasks like getting dressed for the outdoors, independence is a skill that needs to be practised, just like any other. 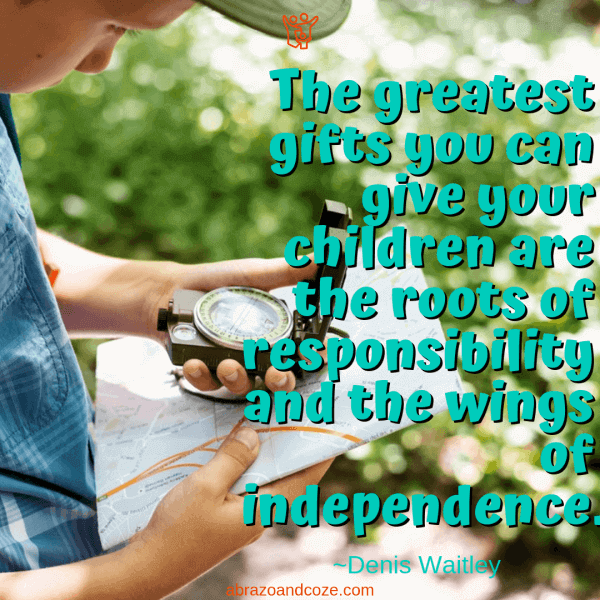 Responsible, independent children will take to adult life far more easily when the time comes, than one that’s had everything handed to them on a plate, without the necessary practice of doing things for themsevles. Clearly, it’s a long process to raise independent children. No matter when you start, however, your kids will benefit from the practice. Ideally, you’ll start with attachment parenting techniques including babywearing and responsive, gentle parenting. That will set the stage for children to feel confident in doing their own thing – they’ll know they have a parent to fall back on if things go wrong. They’ll start learning how to be independent right from the start. As they grow, you’ll be able to teach them how to do age appropriate chores. And then as they show a basic proficiency, you can assign those chores to complete independently. You can teach them to be financially literate from a young age to ensure they have the skills they need to succeed as independent adults. To help you along that path, consider enrolling in Family Money School. It provides lessons to walk you through how to teach your children about all aspects of money management. Lessons use real life and engaging activities to keep your children focussed and to maximize learning. When they’re even older, you can continue to assign new chores and household tasks, like cooking, laundry. You’ll ensure they know how to budget their money. And as part of that, they’ll practice by paying for their transportation expenses after learning to drive. By ensuring they have plenty of opportunity to practice, your independent children will be well set to be successful adults. 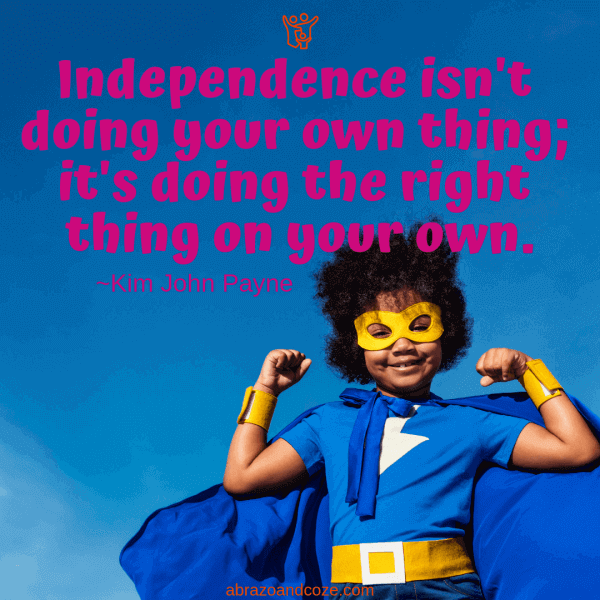 How do you teach your child to be more independent? Let me know in the comments.